Dr. Vitaly Fishbein scored 50% on GIQuIC on finding adenomatous polyps on colonoscopy. The average finding is 25%. In the 1920s, management at the Hawthorne Works, a large factory complex of Western Electric in Illinois, ran a series of social experiments by making changes in one section of the factory and not making changes in the other sector of the factory. They improved the lighting in one section, for example, or extended break times for one group and not another. I remembered this experiment when joint ACG and ASGE task forces were developing quality indicators for colonoscopy in 2005. It occurred to me that once we had the quality indicators, that we could use them to improve the quality of the work just by monitoring the outcomes. In fact, my peers have shown that having an annual “Report Card” for colonoscopy improved the performance of those endoscopists receiving it. One study showed that adenoma detection rate (ADR) improved by nine percentage points for the six physicians receiving a report card while implementation of standard procedures in another study raised ADR by 8%. As the joint task force began its initial work on quality indicators in 2005, the health system I was working in at the time, Sentara Healthcare, had been improving quality in areas of clinical care by measuring adherence to protocols and pathways. After the task force developed the quality indicators, I went to Sentara’s management and requested assistance with improving the quality of gastrointestinal endoscopy. I requested assistance from the IT department and use of the server at Sentara to create a pilot registry. I envisioned that this registry could accept data from disparate software and not only measure but compare some of these quality indicators devised by the ACG and ASGE. Sentara was very forward thinking and interested in being able to improve the quality within the health system. They agreed to donate the time of some senior people and builders in IT and a lead analyst to build the pilot. Other physicians from the task force as well as ACG and ASGE members interested in quality improvement came together to form an advisory committee to determine what measures would be included and define those measures. This Benchmarking Advisory Committee elected to focus on colonoscopy, given that this is the most frequently performed GI endoscopic procedure and the one the public is most familiar with. We turned to software vendors and a gastroenterology pathology group for funding. We developed a pilot and ultimately, we had 21 sites across the country with 83 participating physicians. After we collected a reasonable number of procedures, we began looking at the measures based on the colonoscopy quality indicators to see if we successfully captured the actual data. We ran an audit on the studies that had been done to see if the reports and the procedure photos of the reports we requested were matched for accuracy and they were. Knowing that, we pushed forward with integrating other physicians and more data. In 2009, we presented these data to the ASGE governing board and the ACG board of trustees. We showed them the proof of concept and requested funding from the two societies to see the project through and build a national registry. With that, we received approval and funding from both societies. We formed a 501(3)(c) nonprofit organization that was separate from the societies, but jointly funded by the two organizations. We registered for business and selected a company to build the registry. In July 2010, the registry went live with our first participating centers in the registry. By September 2011, we reached our first 100,000 colonoscopies. In November 2014, we reached 1 million colonoscopies. Then, in less than year – September 2015 – we reached 2 million. In late January 2018, we reached 6 million colonoscopies. The growth of GIQuIC is amazing. We began collecting data on EGDs in 2013 and as of January 2018, we had nearly 1 million in GIQuIC. Although colonoscopy and EGD are currently the only two procedures being measured in GIQuIC there is interest in adding more procedures and perhaps non-procedural GI quality indicators. There are now more than 4,500 participating endoscopists at more than 650 locations. That is more than one-third of the clinically practicing gastroenterologists in the country and this growing number enables us to have very narrow and accurate 95% confidence intervals for the data that come out. The first abstract from GIQuIC was presented at DDW 2017 and GIQuIC has submitted five abstracts to DDW for 2018. GIQuIC now has a research committee for reviewing requests for data to be used for proposed research. Since 2014, CMS has certified GIQuIC each year as a Quality Clinical Data Registry, which means physicians have the option of having their previous PQRS data and now MIPS data submitted directly to CMS from the GIQuIC registry. That is a big breakthrough because it markedly reduces the workload for the individuals that need to do the quality data collection. In my original practice, the quality assurance nurse told me that it decreased the amount of time he spent each month producing quality reports for our office endoscopy unit from more than 20 hours a month to less than an hour a month. It is totally automated. As the physicians prepare their endoscopy report, they populate all the data fields. With just a few keystrokes that data are brought into the GIQuIC database. One can load a month’s worth of data into GIQuIC in less than 2 or 3 minutes and you immediately can then print out your reports. This is a real-time registry and every time data are submitted, the results change. Currently, there’s a data manager and medical director for every 10 doctors and those staffers can run comparative reports for the doctors in the endoscopy unit. In that way, they are not only improving via the Hawthorne effect, but able to see how they compare to their peers. In 2017, GIQuIC submitted MIPS quality data for more than 1,000 providers. In 2018, GIQuIC is approved to report nine colonoscopy measures and two EGD measures. 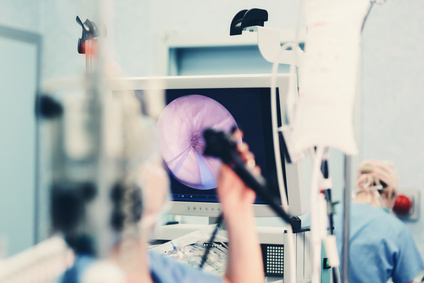 If a physician chooses not to participate in a registry like GIQuIC, he or she is missing an opportunity to be as effective an endoscopist as possible. These physicians are missing the opportunity to prevent colon cancer in a larger percentage of their patients than they are now if they are not monitoring their ADR and other colonoscopy quality measures. We all come to work every day wanting to do the best job that we can, and this is a powerful tool that will not increase our work time and still allow us to improve our performance. Before GIQuIC, I came to work every day thinking that I was doing the best job I possibly could, but I learned the more I focused and followed the results of my work, the better I could become. The mean ADR over time in GIQuIC has increased every year since 2010. The mean ADR has increased from originally 28% to just about 38%. Thanks to Corley et al, we know that for every 1% increase in ADR, there’s a 3% decreased likelihood that a patient of a doctor with that ADR will develop colon cancer before their next scheduled colonoscopy. A 10% increase in ADR is a 30% decrease in the incidence of interval cancer. We have already seen a profound change in the ADR of our participating endoscopists and we don’t know yet how much improvement lies ahead. We have not yet plateaued. There’s a tremendous power of GIQuIC today given the significant number of studies that could be done using the more than 100 data fields just for colonoscopy. There is an enormous amount of information in the registry that could significantly change what we do and what we find is important to do when we do EGD and colonoscopy. That potential is just beginning to be tapped. Going forward, we can examine differences in ethnicity and techniques and how those impact outcomes. We can determine the ultimate goal for the right number of biopsies in Barrett’s esophagus screening. We can discuss following not just physicians, but patients over time through the registry to see the ultimate outcomes. Additionally, though we overcame many hurdles early on by allowing for different software to report into the same database, a bigger hurdle is just now being overcome. The registry has been having discussions for 7 or 8 years with the software vendor, Epic. Epic is now building a GI module, which is supposed to be available in its 2018 version. Within that module, their templates for endoscopic procedures are compatible and capture the data fields for GIQuIC. Today, more than half of the hospital patients in America are on Epic, so that opens opportunities for many more facilities to participate in GIQuIC. That offers a significant growth and utilization potential for GIQuIC. It excites me that after 13 years, there is still so much potential for a project borne from a desire for self-improvement.